A video of Egypt’s Grand Mufti, Sheikh Ali Gomaa (or Gom’a), which began circulating weeks before the massacre, helps elucidate. While holding that Muslims may coexist with Christians (who, as dhimmis, have rights), Gomaa categorized Christians as kuffar — “infidels” — a word that connotes “enemies,” “evil-doers,” and every bad thing to Muslim ears. 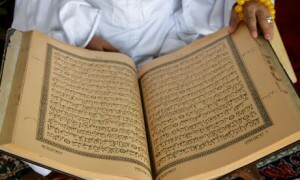 After quoting Quran 5:17, “Infidels are those who declare God is the Christ, [Jesus] son of Mary,” he expounded by saying any association between a human and God (in Arabic, shirk) is the greatest sin: “Whoever thinks the Christ is God, or the Son of God, not symbolically — for we are all sons of God — but attributively, has rejected the faith which God requires for salvation,” thereby becoming an infidel. Christians: You have the wrong idea about us; we don’t worship the Christ. MEMRI, for instance, recently published a report titled “The Sheikh of Al Azhar in an Exceptionally Tolerant Article: Christianity, Judaism Share Basic Tenets of Islam.” Of course, the day after this report appeared, this same sheikh — Islam’s most authoritative figure — insisted that the American ambassador wear a hijab when meeting him: just as Muslim “radicals” compel Christian girls to wear the hijab, “moderate” Al Azhar compels U.S. diplomats. The fact is, this Quranic verse is as much a cornerstone of Islam’s view of Christianity as the unity of God and Christ is a cornerstone of Christianity, articulated some 1700 years ago in the Nicene Creed. The issue is clear cut for all involved. Accordingly, how can one fault Gomaa? As Grand Mufti, he is simply being true to Islam’s teachings. Indeed, his consistency is more commendable than the equivocations of Western ecumencalists who, by falling over themselves to assure Muslims that they all essentially believe in the same things, demonstrate, especially to Muslims, that they believe in nothing. Incidentally, if Gomaa upholds the plain teachings of the Quran concerning who is an infidel, is it not fair to assume he also upholds the Quran’s teachings on how to confront them, as commanded in Quran 9: 29: “Fight … the People of the Book [Jews and Christians] until they pay the Jizya [tribute]with willing submission, and feel themselves subdued.” Of course, prudent Muslims, undoubtedly like Gomaa himself, know that now is not the time to talk openly about such things. Either way, here is another reminder of how Quranic verses and terms that Western people brush aside as arcane or irrelevant have a tremendous impact on current events — such as Egypt’s Maspero massacre: For the same word Gomaa, the nation’s Grand Mufti, used to describe Christians is the same word Muslim soldiers used when they opened fire on and ran over Christian Copts; the same word twenty Muslim soldiers used as they tortured a protesting Christian; and the same word Muslims hurled at Christians during the funeral procession for their loved ones slain at Maspero: Infidel.